A few weeks ago I declared the end of gardening season and thus the end of my weekly gardening posts. Ha! What was I thinking? Just because I am not outdoors in the garden doesn’t mean I am not thinking about the garden. That’s how I ended up writing last Sunday about gardening and climate change. During the week I found a great blog called My Climate Change Garden. It’s by a UK blogger but still relevant. One of his recent posts is about how important it is to plant trees and another about how gardening can have a positive effect on climate change. But wait, I am getting off track, burbling away. Just because I am not in the garden doesn’t mean I am not gardening. Reading about gardening and making plans for next growing season are all a vital part of the process. In other words, I am making up excuses to keep writing about gardening stuff every week or so! Do you mind? Remember how early this year I wanted a pond and Bookman said no way? 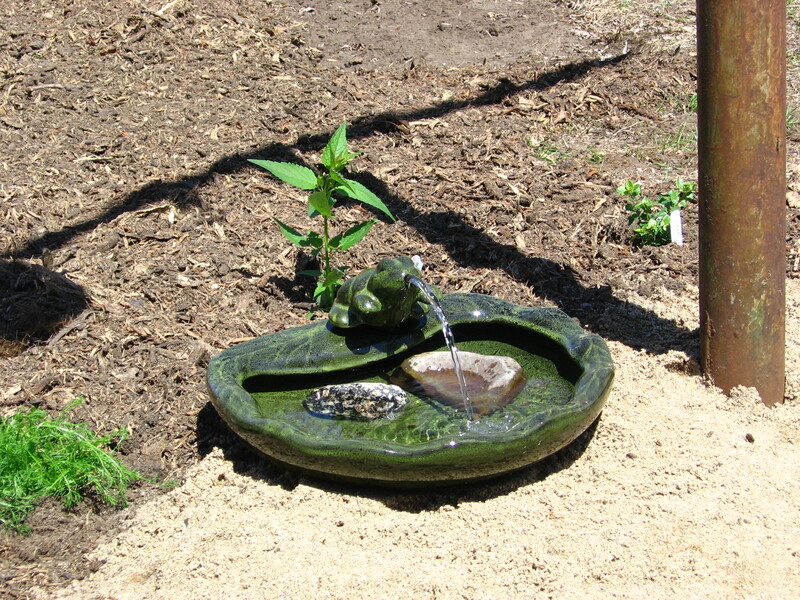 And then I bought a solar frog fountain to sooth my no pond sadness. The fountain was a lovely addition and the sandy beach I made around it was a popular bird destination. They even held a beach volleyball tournament on it one week in July. And the gentle splashing of water from ceramic froggy’s mouth was a pleasant sound while outdoors. But darn it, it was no substitute for a pond. Well next spring I am going to get my pond and I can do it without Bookman’s help. I discovered a video on how to make a small pond using a plastic storage bin. See how easy it is? I have even already decided where to put it. It is going to go on the side of the garden that still has some grass (but not for much longer will the grass be there). We will be adding a rain barrel at the downspout on that side of the yard this spring and I am going to place the pond in a sunny spot not so very far away from the barrel and the barrel’s overflow will be directed into the pond and then if there is pond overflow, that will get directed into a small “wetland.” The wetland probably won’t happened next year, the pond will be enough and I will need to see if there is enough overflow that I even need a wetland. As much as I want to go all out, even I have to admit that patience and one-thing-at-a-time is a good idea especially when it comes to “big” things like a pond and a wetland. Can you also say slippery slope? Because, don’t tell Bookman, but you know as soon as I get my little pond going it will be good for a year, maybe two, and then I will decide it needs to be bigger. Maybe by then I will have been able to convince Bookman what a great idea that would be. But for now, let’s just keep that bit of intel on the down low. I don’t want to scare Bookman. Last week on Tuesday I got the first 2014 seed catalog in the mail. Bookman got the mail from the box and put the catalog on my book table next to my reading chaise. How exciting! I am not going to look at it until January though, I told myself. Yet I left it on the table. And every day I told myself I am not going to look at it until January. Friday I thought, well if I am not going to read the catalog until January, I had better put it away somewhere. Imagine my surprise on Saturday afternoon when I sat down to read and the catalog was still sitting on my book table on top of all the books! I picked it up. I’m not going to read it until January but it won’t hurt to just flip through it. A little over an hour later I emerged from “flipping through it” with all kinds of ideas buzzing around in my head. New plants to try, different varieties of things we’ve already grown that might be good, and lots of “I wonder if we could…” and most of all, “where could I plant …?” And it quickly became clear that I am going to have to dig up part of the backyard belonging to my neighbor-of-the-perfect lawn in order to accommodate everything. Do you think he’ll mind? What if I promise to share? And he won’t even have to weed or water, I’ll take care of it all. Yup, I’m sure he won’t mind. All the best the neighbour and the pond! Though the Pond does inspire me…so what if I live in a high rise apartment with a verandah that is blot on the name of verandahs!!! cirtnecce, thanks! You could totally have a pond on your verandah. I’ve seen ponds created in half barrels and very large ceramic pots. If you don’t have the space I bet you could find a small ceramic pot and grow watercress or something. that sounds awesome…let me google…I tooooo love the internet! I hope you find something you can do. And if you go ahead and make a pond, be sure to send a picture or post on your blog! I love your gardening posts. When I dug my pond (I have sandy soil so it was very easily dug) it took just seconds for the pond skimmers and all sorts of interesting wild life to turn up and join the party! I’m always casting jealous glances over to my neighbour’s plot, I have too many ideas but not enough garden! I always did want a pond, too- especially to have koi but I was always afraid of neighborhood cats, raccoons, and mosquitoes possibly breeding (until I learned about mosquito fish!) we had a problem area in our backyard where the ground was low and it was always damp- perfect place for a pond and/or mini wetland I always thought. But I never materialized that idea and now I don’t live with a yard anymore. Anyway, I saw a tutorial once on making a pond using plastic kid’s wading pool as the base. Seems like a similar idea. Jeane, I’m not so interested in fish as I am in frogs and dragonflies and other things that will eat bad bugs in my garden including mosquitoes. Sounds like you had a perfect place for a pond. Maybe some day you’ll have a yard that will support a pond again. I think I’ve heard something before about using a wading pool to make a pond. I’ll have to look that up! My cats would put an end to bird volleyball but a nice idea nonetheless ! Debra, poor birds! That’s one reason my cats are strictly indoors. There are a couple outdoor neighborhood cats but I’ve not seen then catch any birds in my garden except once about two years ago. Yay to pond, sandy beach, wetland and more gardening posts, I wouldn’t mind at all. I don’t know if I’ve ever admitted this but I come from a long line of market gardeners. I don’t usually admit it because without a doubt I am the black sheep in the family – the one who can kill a plant just by looking at it. But, I do know what it is like to live around gardeners and I swear that most of you enjoy the planning season more than the doing season. I know Grandad did. This was the time of year he would spend hours pouring over catalogues deciding what he was going to plant next year. I remember him doing that more that I remember him actually working in the garden! After a hot, dry summer, I love slipping into the gardening dream stage. Love the idea of the rain barrel and the pond. May make use of that at some point. At present I use the rain barrel at the cabin for compost tea–special gift to plants. Jenclair, isn’t garden dreaming wonderful? It is stress free and anything is possible. Directing rain barrel overflow to the pond popped into my head since the woman in the video said never use tap water in the pond. And then I was reading a yesterday and it was talking about ponds — a good sign! — and suggested something similar and even went so far as to talk about setting up a gray water system directing water from the washing machine into a rain garden that drains into a pond. It’s a brilliant idea, now I just have to convince Bookman of that! I’m so glad Bookman doesn’t read your blog! I promise to support the sisterhood and keep Mum. If he finds out, it won’t have been from me! And no, of course we don’t mind more gardening posts. It’ll be summer here anyhow and very appropriate. whisperinggums, well actually Bookman does read my blog and he’s been laughing and shaking his head ever since he read this post. But he’s gone from no pond to giving in. Now whether he will leave me on my own to dig my little storage bin pond in the spring, well, I suspect by that point he’ll have come round and will help me. Then once he sees a little pond is no big deal, it will be much easier to persuade him into something larger. I’m sure you have your own persuasive techniques you use on Mr. Gums 😉 Oh yes, you are having spring now and I hope it beautiful. Oh yes, that comment was tongue-in-cheek. I was sure that he did. Hard to convey that nuance in words on a screen! I’m glad he’s seeing the light! I hope you do continue your gardening posts–why do they need to stop over the cold months anyway? Even with the cold and snow there are lots of things going on outside in the yard and lots of planning for next year! Isn’t the internet great for finding new ideas? I hope to have a little more free time once the holidays are here and I am off work (and finished with my class) to do some surfing for a few of my own projects. I love the pond idea–I bet once Bookman sees you working on it, he will want to help out….! And I can’t resist looking at catalogs that have good things in them I want (if only to wish for and not actually buy). By January I bet you will be getting spring planting catalogs anyway. And fountains are very soothing–I like that gurgling effect. My back yard is too shady to grow grass–you are inspiring me to think outside the box and thing of ways to plant other things and make it a nice, comforting area. I should take a photo and have you look at it for ideas (but it is really pretty sad looking, so I am embarrassed to have anyone see it!). Danielle, I don’t need much encouragement to keep doing gardening posts! 🙂 The internet is an inspiring and dangerous place for ideas! Bookman has not said anything about my pond. I think he may have realized his is a losing proposition and so has given in. We’ll see come spring. Shady is a challenge but not impossible. Half my front yard is in shade from my two older apple trees and the grass over the last few years has pretty much died. Come spring I am going to be planting some ostrich ferns, wild ginger and ramps (wild leeks) underneath them. I’d also like to do a big swath of spring ephemerals that will bloom before the trees leaf out and then die back as the season heats up. I haven’t yet decided what, but there is currently no hurry 🙂 Don’t be embarrassed by your shady back yard, see it instead as something that has great potential!